Properly designed automated endoscope disinfecting washers can deliver the proper endoscope disinfecting temperatures. Cleaning Endoscopes cleaner with less damage. Properly designed automated endoscope washers can deliver the proper endoscope disinfecting temperatures. Always refer to manufacturers specifications prior to establishing your reprocessing protocol. Automated Endoscope Washer Temperature Parameters for Cleaning Endoscopes should not be heated over 199,4°F (93°C). Automated Endoscope Washer Temperature Parameters for Cleaning Flexible scopes should not be heated over 149°F (65°C). Properly designed automated endoscope washers can deliver the proper endoscope disinfecting temperatures. The thermal disinfection temperature of the water for the final rinse is the safest and most easily validated method to eliminate any germs which may be in the water system. This method is performed by heating the final rinse water to a temperature of at least 93°C. Since this high water temperature would damage the endoscope it must be cooled to below 60°C where then the disinfected final rinse water can be safely be applied to the endoscope for the final rinse. Contact yourCEBA for surgical instrument cleaning detergents, surgical instrument washers, enzyme surgical instrument cleaners that lubricate, surgical instrument detergents with four enzyme surgical instrument cleaners and lubricating surgical instrument enzyme detergents that will clean surgical instruments and scopes faster with lower enzyme detergent surgical instrument cleaner costs. Contact us for: surgical instrument cleaning sponges, endoscope cleaning sponges, height adjustable work sinks, height adjustable work tables, countertop surgical instrument washers, surgical instrument washer disinfectors, and table top sterilizers. Articles have been published worldwide regarding the complexity of manually reprocessing flexible endoscopes and the related concerns. Automated reprocessing and combination 4 enzyme detergent complex cleaning concentrates can provide valuable alternatives and have demonstrated superior outcomes. The new developments, in automated scope cleaning and cleaning concentrates, can improve scope performance, and protect flexible scopes from damage, while reducing the risks and costs associated with manual reprocessing. These developments have shown an increase in safety and have demonstrated a decreased risk of nosocomial infections. Cleaning Endoscopes cleaner with less damage. Endoscope Cleaning Brushes should be of the proper diameter so that the tips of the bristles, of the endoscope cleaning brush, meet the surface of the endoscope. Endoscope manufacturers have focused on improving the functionality and clinical performance of scopes. One main issue still remains and ongoing concern... human error. The most common human errors occur during manual cleaning and when flexible endoscopes are connected to automated endoscope re-processors (AERs). These errors occur in endoscope departments worldwide and have not been correlated to specific scopes or re-processors. Validation of these reprocessing methods and operations may be written down in Standard Operation Procedures (SOP‘s) but in fact, the verification on how close these procedures are followed may be quite difficult. Product improvements by scope manufacturers require ongoing changes to reprocessing protocols and present new challenges to the reprocessing staff as well as the manufacturers of automated washer decontaminators and disinfectors. These ongoing changes require an ongoing review of the cleaning, disinfection and sterilization protocols. Reprocessing departments contend with daily shortages of flexible scopes that are ready to use and frequently experience FTE levels that are inadequate for manual cleaning. These factors may lead to endoscopes not being properly cleaned according to manufacturers or association recommendations. It has been found, that when a reprocessing staff is pressured for increasing the turnaround rate, cleaning may not be given the high priority necessary, due to the assumption that the sterilization to follow will provide a medical device that is safe for patient care. If an instrument is not thoroughly cleaned, it cannot be sterilized. Proper cleaning is the prerequisite for sterilization. For the protection of scope surfaces we recommend the use of Purified Water (DI or RO de-mineralized water), at least for the final rinse treatment. A cleaning agent in neutral pH-range (less that 9) can augmented with an enzymatic cleaner. Combination all-in-one Enzymatic Surgical Instrument Cleaner detergent complexes have been shown to be highly effective. Depending on the water quality, it may be necessary to use a cleaning concentrate that softens the source water for the treatments: cold water pre-wash, detergent wash, and purified water rinse/lubrication. When the treatment processes are finished, the scopes should be removed from the reprocessor avoid corrosion.As recommended by virtually all manufacturers of Scopes Surgical Instruments and Instrument Containers, Cleaning Concentrates (alkaline) that require a neutralizing agent (citric acid) should not be used as they can etch instrumentation. Aluminum is highly susceptible to etching. Dyed anodized aluminum parts are not easily identified as aluminum. High level enzymatic formulations (Enzymatic Surgical Instrument Cleaners), in combination with a high level surfactant chemical complex, have been shown to be more effective in removing stains, hard water deposits, and encrusted bioburden, while being safe to use for rigid or flexible scopes. When using a Washer Decontaminator-Disinfectors Pressure Box for automated cleaning, connect the channels of optics with the insufflating channel to the rinsing connections of the washer rack. This will effectively clean the lumens and working channels while cleaning the surface of the scope. General Procedures for Manual Cleaning of Scopes, Endoscope cleaning consists of mechanical and chemical cleaning of internal and external surfaces. This includes brushing and/or flushing of all internal channels with sterile, filtered or drinking-quality water and enzyme-detergent. 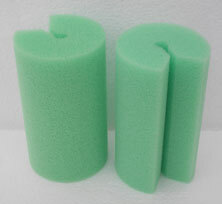 Tubular Endoscope Cleaning Sponges provide and additional margin of safety when hand washing Endoscopes.